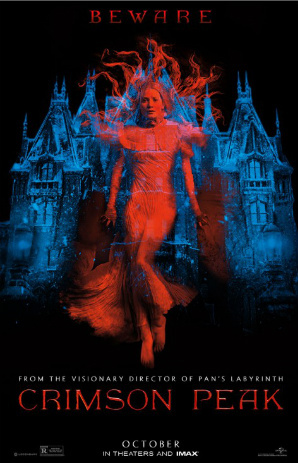 Melissa Parkin's Blog: REVIEW: "Crimson Peak"
At the turn of the 20th century in Buffalo, New York, young aspiring writer Edith Cushing (Mia Wasikowska) meets the dashingly mysterious inventor Sir Thomas Sharpe (Tom Hiddleston), who has come aboard to pitch a business proposal to Edith’s father (Jim Beaver). When tragedy strikes, the forward-thinking Ms. Cushing quickly finds herself married to Sharpe and gets whisked away to his home in England. The newlyweds arrive at Allerdale Hall, the Sharpe family’s beautiful, yet ramshackle estate. With red clay bubbling up from the foundation of the property and mixing with the snow, the outside grounds appear to run red with blood, hence the nickname “Crimson Peak.” The scenery isn’t the only thing foreboding here. Edith is met by Thomas’s unwelcoming sister, Lucille, who despite Edith’s kind efforts refuses to warm up to her brother’s new bride. Things take a turn for the worst as gruesome apparitions of former inhabitants appear to Edith at night. Desperate to discover the true history of the house, she soon uncovers something far more horrific—the buried truths that affect her very life. You can argue that a movie shouldn’t be judged on the merit of its advertising, but when it’s misleading to moviegoers who fork out ten bucks a ticket, you can’t simply chalk it up as a trivial error. Universal Studios Hollywood even adapted the film into one of their mazes for their annual Halloween Horror Nights event this year, further marketing it as a blatant horror piece. This issue aside, the movie still falls short of expectations even when properly placed in the gothic romance category. At the height of the film, Crimson Peak delivers on all cylinders. The grandiose, gothic scope of the manor is one of the best sets put to film in recent history. Oscar worthy production design brings this dilapidated yet beautiful estate to life, and the cinematography captures its intricacy with flawless depth. Yet, Edith herself doesn’t ever really display any of these inimitable traits. Calling a pigeon a “flamingo” doesn’t change the fact that it’s still simply a pigeon, no matter how many people say it. If anything, Edith is incredibly naïve, especially for a twenty-four year old. Plus, Mia Wasikowska has a rather enigmatic quality to her, showcased wonderfully in films like Jane Eyre and Stoker. Putting her in the shoes of a friendly heroine that the audience should be rooting for on the other hand…it’s apparent that she’s miscast. Charlie Hunnam (Sons of Anarchy) also seems out of place with his turn as Edith’s pining and polite childhood friend, Dr. Alan McMichael. Tom Hiddleston and Jessica Chastain prove to be the true scene stealers here, despite them having to chew up the sometimes clumsy dialogue. The untapped potential to this film is enough to make any gothic fan gnash their teeth with frustration. Despite the impressive sets, gorgeous costume design, and talented cast, Crimson Peak sadly proves to be magnificently mediocre. "Crimson Peak theatrical poster" by Source (WP:NFCC#4). Licensed under Fair use via Wikipedia.